It was late as I pulled into the drive leading to the middle section at DePuy's Spring Creek. Over the western mountains the ominous black clouds of an approaching summer thunder shower were building. No matter, I had come to fish and fish I would. Much of my fishing during this time of my life is confined to that narrow window between twilight and dark. It was not always thus, but the demands imposed by a career, the tax man and bills - well, you get the idea. Fishing during the final moments of the day does have its advantages, along with its shortcomings. The crowds of the day have faded with the daylight. The daytime heat has been replaced with the coolness of the evening. However, time is of the essence. The twilight angler has little time for indecision, scant opportunity for procrastination. If there are no fluttering caddisflies, no dancing spinners, the twilight angler is reduced to trying to guess what nymph pattern may induce the trout, which likely fed heavily all day, to strike. The fading light makes the subtle take of a reluctant trout sipping in a size #18 Pheasant Tail nymph a difficult task to detect. If the pattern is wrong, the presentation not quite right, the twilight angler has no time to make the necessary corrections. Despite the obvious disadvantages of fishing in the twilight hours, I have come to cherish them as some of my finest angling opportunities. I have long since past the stage in my angling career when I had the need to prove my skill and prowess to anyone, even myself. Any contest that may exist is strictly between me and the trout, which is the way it should be. If my casting is less than perfect, which it often is, there is no one to see except me, and generally I don't care. It doesn't matter if I am wearing my oldest fishing vest, if my rod is a 25 year old model; they suit me, they please my sensibilities, and I am at peace with that. 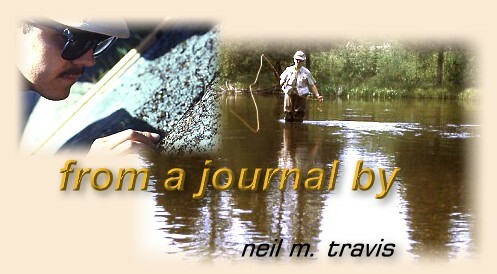 Once again, as when I first began fly fishing, I find that I am fishing to please myself and that, I feel, is as it should be. Twilight angling adds an urgency to the moment yet, in the same instance, a quieting influence on the spirit. On this evening a white-tailed doe and fawn ran up the trail before me, then turned to watch me as I stop to study the water. My sudden appearance on the stream bank startled a Great Blue Heron who gave a disgusted squawk and flapped off upstream. Tree swallows dipped and wheeled over the stream and surrounding meadows, swooping through the swarms of dancing spinners that held the promise of some exciting angling opportunities in the next few moments. The smell of fresh cut alfalfa sweetened the breeze that occasionally wafted down the valley. The distant thunder shower gave voice to a low primeval rumble, interspersed with sporadic flashes of lighting. Spring creek trout are notorious for their selectivity, their studied indifference to the most carefully crafted imitation, the smoothest presentation and the finest gossamer tippets. However, given the correct set of circumstances they can be as easy to fool, as easy to con, as a country bumpkin being duped by a fast talking city slicker. Over time, two sets of circumstances have proven to be just such occasions: heavy spinner falls and wind blown hoppers. On this evening the spinners were abundant, and as the evening shadows deepened they came down en masse, turning the once unmarked surface of the stream into a mass of concentric rings. This is no big fish tale, no story of keen wit or great feats of casting; the trout were easy, and I took advantage of their naivete. A simple hackle-winged spinner lobbed to the nearest feeding trout brought the first of several satisfying responses. The battles were spirited, but brief, and the fish were all golden-hued browns, none longer than 16 inches. Had I searched through the risers I am certain I could have found larger fish to challenge my abilities, but to what end? Would one 20 inch brown be anymore satisfying than several 14 inchers? If so, more satisfying for whom? My revelry was suddenly broken by a flash of lighting and an instantaneous crash of ear splitting thunder, that was much to close for my feeling of well being. The soft breeze suddenly became a gale, whipping the willows and cottonwoods like blades of grass. It was time for a hasty retreat. Safe in my vehicle, I watched the storm spend itself in blinding flashes of lighting and sheets of wind driven rain. Then, as quickly as it came, it exited over the Absarokas, dragging its ragged tails behind it to spend its fury over the Beartooth Plateau.